This topic contains 7 replies, has 3 voices, and was last updated by Alexander Bautz 2 weeks, 6 days ago. I wrote a rule that made a checkbox field readonly. I assumed it would leave the checkbox selections visible and just disable them so they could not be checked or unchecked. But instead the whole field disappeared. Is that how it is supposed to work? 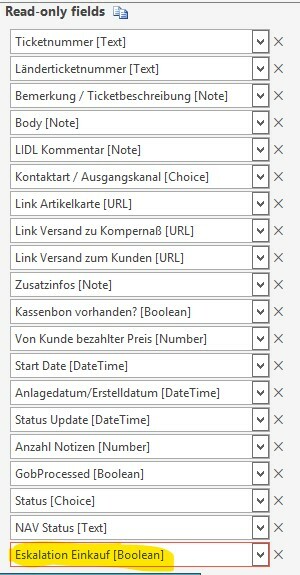 And a related question, is it possible through DFFS rules to make specific checkbox choices readonly, but leave others available, within the same column? Using a readonly representation of a checkbox field makes sense, I have therefore added this to the upcoming release. Your other request will however not be added as default functionality, but you can add this custom code to achieve it. Change “Color” to your field internal name and “Blue” to the option you want to set as readonly. I found this thread because I stumbled up on the same issue. Although using a quiet new version checkboxes are still being removed instead of being disabled. Is it still required to use the script or should it be included in the latest release? This was added back in 2015 – can you show me some screenshots so I can see how it looks in your form? I’m sorry if I’m missing something obvious here. No problem, I’m glad we figured it out.